Finding information on old wagons and western vehicles can be like looking for the proverbial needle in a haystack. Whether you're looking for unique materials to add to the western décor of your home or office, or are just trying to uncover more information on old vehicle companies, our exclusive lithographs and rare catalog reprints deliver unmatched quality and the assurance of an authentic reproduction. Occasionally, our archives receive enough demand for a particular brand that we reproduce special supplementary pieces from our collection. Below is a small sampling of additional materials available from Wheels That Won The West® retailers. Another great resource for your library is our limited edition reprint of the 1915 Springfield Wagon Company catalog. It's 32 pages in length and is loaded with detailed specifications of the wagons and their parts. The specs for boxes, wheels, tires, skeins, and weights are spelled out and there's more information on brakes, bolsters, springs, and tongues. Additional, almost impossible-to-find, information referencing serial numbers, dates of skein size changes, and dates of wheel height changes are included, $20 plus U.S. s/h. Additional materials from the Wheels That Won The West® archives include signed copies of the 1972 hard-to-find book entitled, "The Old Reliable--The History of the Springfield Wagon Company, 1872-1952." 150 pages of detailed information about the beginnings and growth of this company, $26 plus s/h. 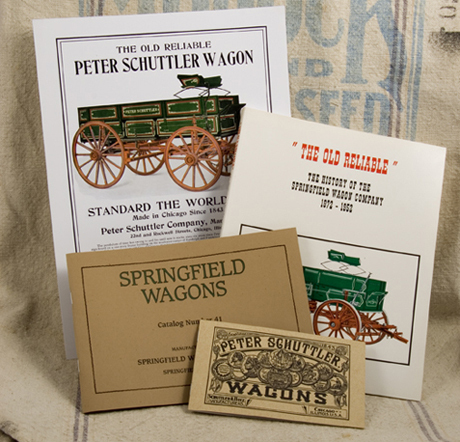 Here's another great reference material from the legendary Peter Schuttler Wagon Company. This broadside/flyer has been professionally reprinted on high quality, acid-free paper and is on a heavier stock with oversized borders making it ideal for framing. Whether you're a fan of early American horse drawn transportation or just enjoy old advertising scenes from days gone by, this is a great piece, $12 plus s/h. Select the item of your choice in the drop down menu below and click BUY NOW.